Installation, 2013. 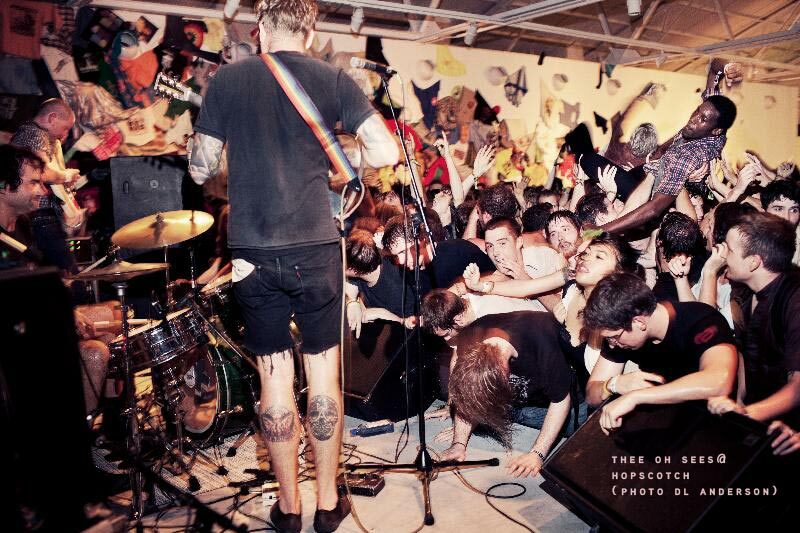 Artspace Pop-Up, Raleigh, NC. Light, paint, vinyl lettering, vintage photographs and integrated sound. Dimensions variable. This work explores the fitting room as a private, yet other-oriented, space where identity is often in flux. Lou Reed's lyric, “reflect what you are/in case you don’t know,” functions as both a suggestion and a question. Reversed text leads the viewer to read into the illusory space of the reflection. A series of found photographs from the portfolio of a fashion model evoke the presence of another, and the act of representing. The room responds to a visitor’s entrance, as vanity lights flicker on and textural echoes of a melody fill the space. The song "I'll Be Your Mirror" points inevitably to Warhol, the Factory and the oft-fraught nexus of self/other, interior/surface, and celebrity psychodrama. Originally released in 1967 as the B-side of the single, "All Tomorrow's Parties," the song is, in a sense, a reflection of that A-side’s concern with an other-oriented construction of identity. In this installation, the song’s deconstructed melody haunts the viewer. 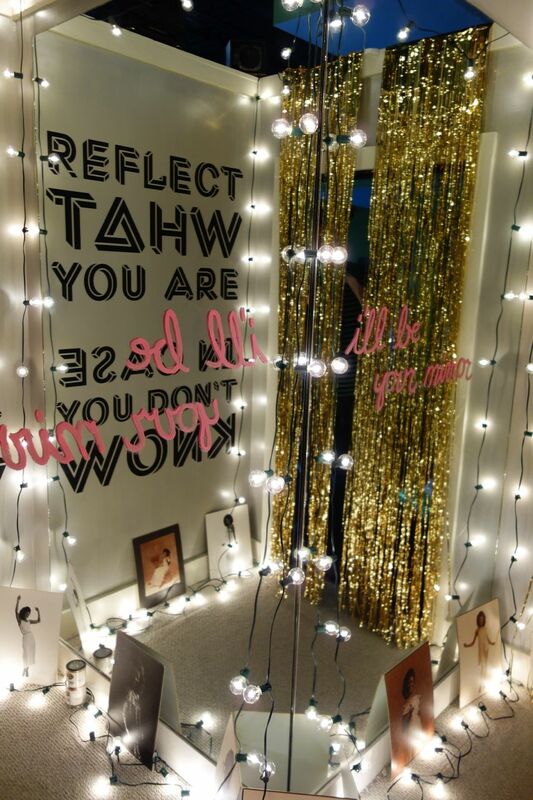 The fitting room becomes an intimate space in which one might consider the relationship of appearance to identity, and consider the reflection as a potential locus of strength and possibility. 2012 installation by Yuxtapongo for Hopscotch. Community-generated installation of music-related clothing on a 70-foot gallery wall at CAM, Raleigh’s Contemporary Art Museum. Explores identity within a culture of sound. All Day Records, Amanda Saxe Barr, Birds Of Avalon, Jon Bowman, Bull City Records, Lauren Carter, Vince Carmody, Kevin Clark, Scott Craddock, Skip Elsheimer, Katrina Lamberto Elsheimer, Sarah Fuller, The Future Kings of Nowhere, Drew & Olivia Griego, Andy Heymann, Bryan Hoffman, Liz Johnson, Cheetie Kumar, Ron Liberti, Alexis Mastromichalis, David Mueller, Neptunes, Sara Phoenix, Molly Renda, Eric Roehrig, Tannis Root Productions, Schoolkids Records, Jenny Schneider, Paul Siler, Ben Spiker, Nicole & Les Stewart, Sarah Tector, Teddy, Michelle Temple, Missy Thangs, Jolee Todd, Ginger Wagg, and Napoleon Wright. 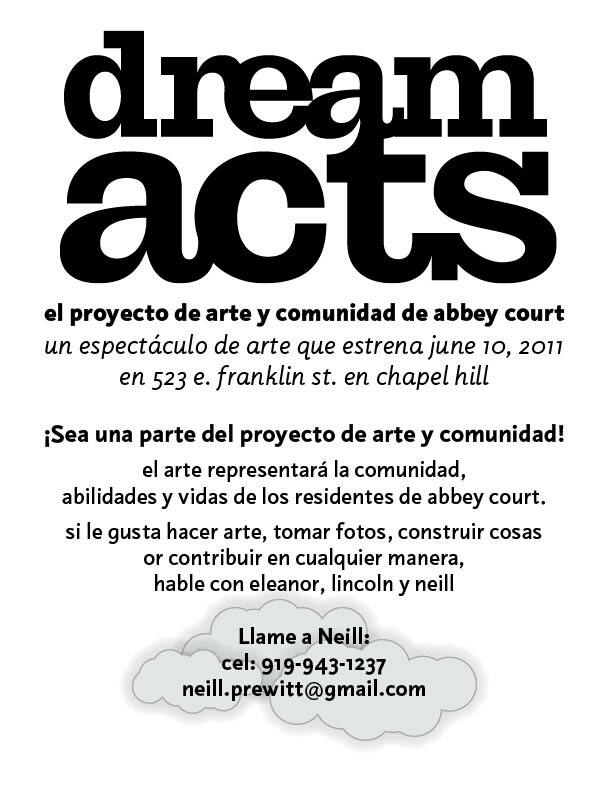 "Dream Acts: The Abbey Court Community Art Project" was a six-month, grant-funded community art project that culminated in an exhibition of work initiated by artists Eleanor Blake, Lincoln Hancock and Neill Prewitt during their involvement with residents of Abbey Court in Carrboro on Jones Ferry Road. The exhibition was comprised of residents’ art, co-created work, and work of the artists. An environmental assemblage of video, photography and objects, "Dream Acts" sought to share the creative energy of Abbey Court, while exploring the boundaries real and imagined that shape our perception of and interaction with an environment or community. "Dream Acts" was the second installment of "Into the Streets," an annual commission sponsored by the Town of Chapel Hill Public & Cultural Arts Office and the Public Arts Commission. Founded with the intention of placing artists within a specific proposed community, the project aims to foster connections between people from within and outside the community. At the Dream Acts exhibition at the former Chapel Hill Museum. Here's a story about the project, and a documentary we made about the experience and the exhibition. The Facebook project page is here. A few words about the piece: In 1959 Charles Mingus recorded a composition called Fables of Faubus for Columbia Records, to be included on his album Mingus Ah Um. Like most of his recordings, it was an instrumental track. But this composition was originally written with lyrics, and Mingus would record a version with accompanying vocals for Candid Records a year or so later. The piece is a rather brazen send-up of Governor Orval Faubus of Arkansas, who in 1959 sent in the National Guard to prevent nine black students from integrating Little Rock Central High. Mingus’s lyrics in Fables of Faubus take on the utter ridiculousness of segregationist attitudes at the height of the civil rights era. His approach to confronting the bitter atmosphere of the times was to take a sideways swipe at the obliviousness of those on the wrong side of the debate. Without being didactic, he struck a blow at the heart of the issue in a way only an artist can. This debate is certain to rage on… I felt I could not let slide the opportunity to speak on the matter through my piece at Block2 this summer.